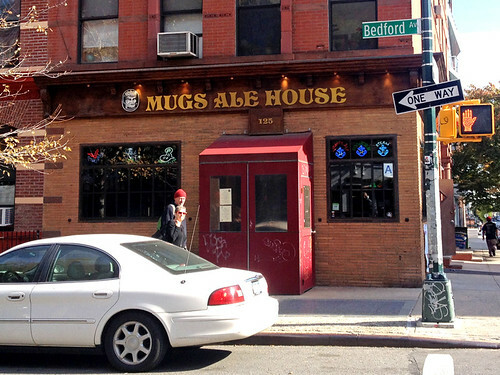 I was meeting a friend for after-work drinks last month, and he suggested Mugs Alehouse as a good, low-key, not too crowded or too hipster-y spot in Williamsburg. I was skeptical, as it looked like the kind of generic sports bar that I usually avoid… And when my friend told me they had a veggie burger on the menu, I expected the kind of gross, bland, frozen veggie burger afterthought that most sports bars include on their menu. 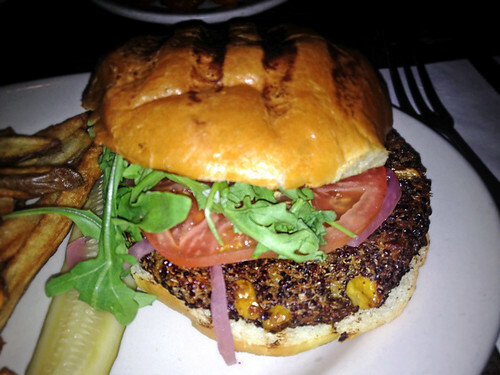 The veggie burger on the menu here is a homemade patty! Quinoa was the prominent ingredient, but there was also corn and some other bits of veggies mixed in with it. It was far better than I normally expect from a bar! More like a quinoa patty (I've had them served on their own like that at other restaurants) than a hearty burger patty, but still tasty. 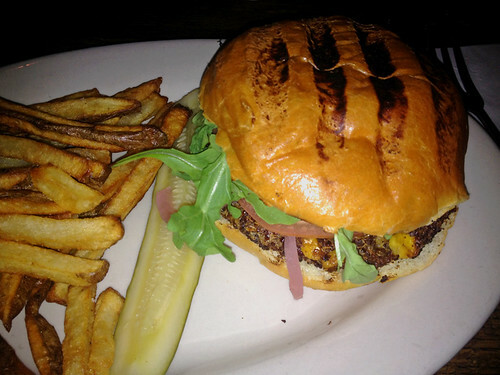 Topped with arugula, tomato slices, and pickled red onions (my favorite! 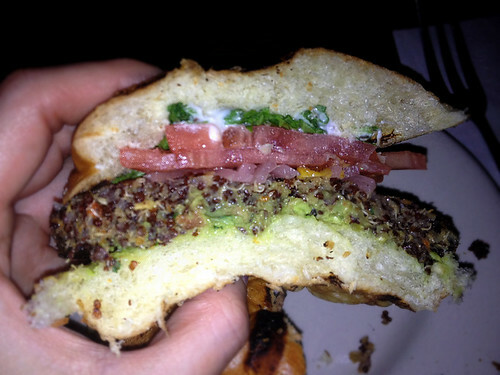 ), as well as herbed mayo and an avocado spread beneath the patty, I was quite satisfied with my meal. The brioche bun was better than the kind of bun I would have expected too – a nice soft, sweet bread, grilled to a light toast. I inquired about the ingredients, and was told that the patty contains eggs, and they were not sure about the bun (so if you are vegetarian but can’t/don’t eat dairy, I would err on the side of caution since many buns not made in-house contain milk or butter, unless the restaurant specifically states that they are vegan). I've never had a quinoa patty. Must find a vegan one somewhere!! I just posted a review of MorningStar Farms' vegan roasted garlic and quinoa patty - it's not as "burger-y", but it's very quinoa-y!